The Fieseler V-1 rocket was a cost-effective flying bomb that possessed a range of approximately 150 miles. It was designated the Flak Ziel Geraet (anti-aircraft target apparatus) to avoid any leakage of the project to Allied spies. It was designed with a pulse engine and consisted of only a few moving parts, making it easier to control. The V-1 rocket’s pulse engine operation made a distinctive buzzing sound, earning the flying bomb the nickname “buzz bomb.” The pulse jet design also gave the bomb the advantage of being able to operate using low-grade fuel. The V-1 rocket was largely feared due to its capability to inflict huge material damage to buildings and homes within a wide area, inflicting dreadful injuries and killing large numbers of people. Although this flying bomb exploded on the surface, it caused a huge blast wave that rippled out from the epicenter. The vacuum left by this blast wave caused a second rush of air as the vacuum was filled, causing a devastating pushing and pulling effect. With its durable plywood wings and Batman-inspired fearsome looks, the V-1 rocket is the missile model of choice for the discriminating collector or enthusiast. 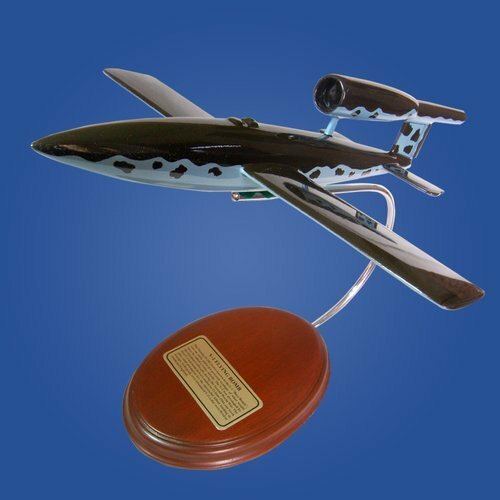 The perfect addition to any scale model collection, this flying bomb desktop model boasts carefully hand-painted accents and excellent craftsmanship. Display one in your home or office today.